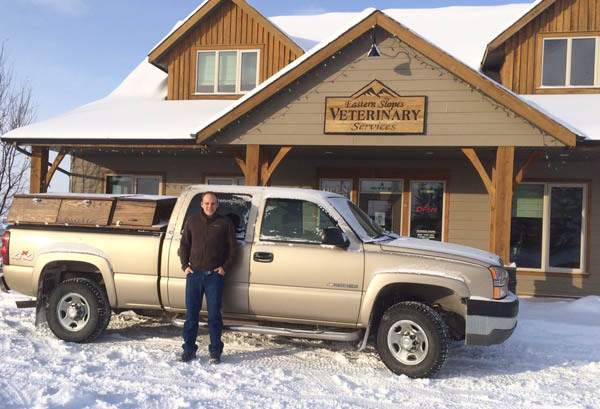 Dr. Jordan Holt is happy to be working in cooperation with Eastern Slopes Veterinary Services to offer on-farm large animal veterinary services in Black Diamond and the surrounding areas. All regular beef cattle veterinary services including bull breeding soundness evaluations, pregnancy diagnosis, obstetrical and calving assistance, herd health inquiries, and prescription consultation. Dr. Holt strives to be available for all of your emergency and after-hours services including calving and other health problems by contacting the clinic at 403-933-3532 and following the instructions on the recording. We keep a small volume of commonly needed bovine medications and supplies on hand. We are able to order medications and supplies and have them available in 1-2 business days if we don’t have what you need in stock. Please call ahead for medication inquires and please note that all prescription products will require the creation of a prescription through discussion with a veterinarian prior to dispensing. Referral services for situations where a fully equipped veterinary facility is required. Dr. Holt understands that, depending on the procedure being performed, access to equipment, and environment, not everything can be done on farm. When these situations arise, we will help you to find appropriate veterinary care. On farm emergency and after-hours services including colic, injuries, or obstetrical assistance. Dr. Holt strives to be available for help after-hours when needed by contacting Eastern Slopes Veterinary Services at 403-933-3532 and following the instructions on the recording. Oral and dental care is a vital part of overall equine health. Dr. Holt is equipped to offer equine dentistry to clients who prefer having a veterinarian come to their farm or barn to provide this service. Feel free to contact Dr. Holt at the clinic to discuss equine dentistry in more detail if you have questions regarding this service. Dr. Holt has the ability to perform on-farm Digital Radiography. Dr. Holt can provide surgical services for procedures that be safely performed in the field with the use of sedation and short acting anesthetics including laceration repair, minor surgery, and castrations. Dr. Holt is happy to help you with general health inquires, preventive health, parasite control, nutrition, and other questions you may have regarding the care of your horse. Dr. Holt is accredited to provide this service for clients who are travelling to the USA. Please allow 5 business days prior to the date you plan on leaving to ensure that all the laboratory testing and federal endorsement of your export certificates can be completed on time. Typically, this can all be done quicker than in 5 days but from time to time weather delays or transport delays beyond our control can hamper the process. Address of the Canadian premises of origin of the horse. If you have any questions regarding the export certification process, please contact Dr. Holt at here at the clinic for further discussion. We keep a small volume of commonly needed equine medications and supplies on hand. We are able to order medications and supplies and have them available in 1-2 business days if we don’t have what you need in stock. We will help you get in touch with the appropriate veterinary services for issues beyond the scope of what we offer. For example, if your horse requires, ultrasonography, endoscopy, advanced dentistry, advanced surgery, or other advanced services, Dr. Holt will help you get in contact with veterinary facilities that offer these options.